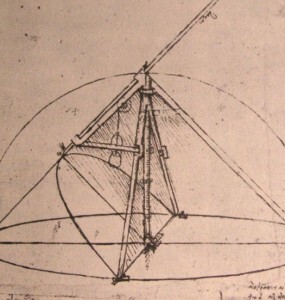 Leonardo da Vinci totally <3’d parabolas. The parabola is actually a hugely important mathematical concept with tons of forms, properties, and even its own history. It can open up, down, left, right, or any other direction. It can be used to graph the trajectory of my last AT&T cell phone that I threw in a lake when it dropped one too many calls. But if you’re interested in that stuff, you should go to the Wikipedia parabola article, and tattoo the word NERD on your forehead while you’re at it. On the SAT, there’s actually not much you need to know about parabolas. So let’s keep it simple, huh? 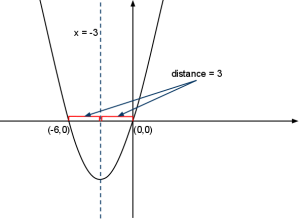 The graph above represents the parabolic function f(x). If the function’s minimum is at f(–3), and f(0) = 0, which of the following is also equal to 0? Right. So let’s translate this into English first (if you’re having trouble with the function notation, have a look at this post for some help). What they’re saying here is that the line of symmetry for this parabola is at x = -3, and that the function goes right through the origin: f(0) = 0 means that this graph contains the point (0,0). They’re basically asking us to find the other x-intercept. Here’s where they whole symmetry thing really comes in. If we know the line of symmetry, and we know one of the x-intercepts, it’s CAKE to find the other. Put very simply, they have to be the exact same distance from the line of symmetry as each other. Since (0,0) is a distance of 3 from the line of symmetry at x = -3, our other x-intercept has to be a distance of 3 away as well! So we’re looking for the point (-6,0). Choice (E) is the one that does that for us: f(-6) = 0. Can they find ways to make symmetry questions difficult? You bet. Will you be ready for them? Yarp. Again, let me say that there are many more equations of parabolas. If you go on to do advanced math in college, you’ll need to learn some of them. If you’re doing three-dimensional math now maybe you know some of them. But you won’t need any of them for the SAT. Know this one (and what the coefficients signify), and you’re good to go. a tells you whether the parabola opens up or down. If a is positive, it’s a smiley face. If a is negative, it’s a frowny face. Easy to remember, no? b is pretty useless for you, as far as the SAT is concerned. c is your y-intercept. If there is no c, that means your parabola has a y-intercept of 0 (which is to say, it goes through the origin). Ready for some practice problems? For a little bit more practice, see this previously posted parabola problem (with explanation). Dude your awesome I got those questions right if anyone who want to know how here is how. It means it has a y intercept of Zero and and since A is negative we know it opens down. 1)It passes through the orgin is right since it has y intercept of Zero.2)It is increasing from x = 1 to x = 6 is wrong since its negative. Freak, this is the problem we have nowdays with Twitter. Grammar, punctioation and spelling don’t count??? They do on the SAT, Dude! Banny, you are one to correct him. First, you misspelled “nowdays.” Second, you misspelled “punctioation” and are missing the comma after it. Only one question mark is needed and the construction of your last two sentences is atrocious. Why are you putting him down? This is not even the English section. Here, we are learning about math. Wow, I give all my respect to you sir! Heh, thanks. I’m just a lonely lad trying to get from a 2010 to 2200+. This whole summer has been a “Disregard people. Acquire knowledge.” mindset. I know it will pay off though. Where does -6=9k come from?! Once you know the point (3, -6), you can plug it into the equation for the parabola. The given equation is y = kx^2, which becomes -6 = k(3)^2, or -6 = 9k. Can you explain #2 on the Math Diagnostic Test? You might want to bone up on function notation to make this question a little easier. The key is that f(6) is a horizontal distance of 4 away from the parabola’s minimum at f(2). To find the point on the other side fo the parabola that corresponds, you need to move a horizontal distance of 4 from the minimum in the other direction, which brings you to f(-2). Here’s a picture of the solution from my book, which might help clarify a bit more. Good question. That’s because in the form ax^2 + bx + c, c is the y-intercept (which makes sense because that’s what y is when x is 0). In the equation in #14, there is no c, so the y-intercept is 0. Sorry again, Michael. I am just practicing problems around here to hopefully raise my math SAT score of 660 to 750+. For number 14, I know that (B) is wrong because a is negative. But if a was positive, for instance 1, would that mean it is increasing from x = 1 to x = 6? Also, what does that really mean and how would you figure out what it is increasing from? Hi Kyle. When a graph is said to be increasing, basically, it means that its y-value is getting bigger as its x-value is getting bigger. Think of “increasing” and “decreasing” as analogous to positive and negative slope. Curves don’t have slopes, of course, but if one is moving in an upper-rightwards direction, it’s increasing. Well, you can either graph it on your calculator and see that it’s decreasing, or you can evaluate it for a few x-values. For example, when x = 1, y = -3, and when x = 2, y = -18. As x increases from 1 to 2, y decreases, so the function is not increasing on from x = 1 to x = 6.
k is a constant. If you use (0, 0), then you can’t solve for k–all you get is 0 = k0^2, or 0 = 0. The square gives you non-zero points on the parabola, which, as you point out, can be used to solve for k.
Hi, so can u please tell me how to solve number 2 on drill #2, i tried to refer to this one but It didn’t work as in this u gave us what is f(0)=0 but in there u didn’t as u just asked about f(6) ?? So how do we solve it?? Hi, so I have a question that I tried to find an explanation for it here which is in drill 2 number 16, the question is if c is greater than 0 how come the right answer is c and not b although b is the one that have the positive y value. Thank you! OMG that’s a typo–my bad! The question is supposed to say c 0. Thanks for catching that. Oh ok now it makes sense.. By the way I really appreciate your work and keep it up.. I think you would be happy if I told you that my I raised my score in math from 560 to 720 on the BB practice tests just from reading your website, don’t have the book yet but will get it soon.. 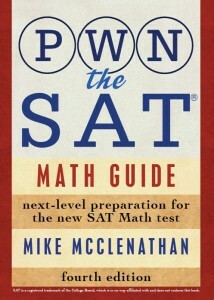 I will take the SAT this Wednesday in school.. didn’t take it before.. So I will get your book maybe for the 2nd time I’ll take the test! But I’m kind of weak in critical reading, I came recently to the U.S. from Syria but although I have a good English i can’t really get a high score in CR maybe it’s because I don’t read a lot.. So do you have any tips?! That is awesome—thanks for your kind words and congratulations on your improvement so far! As for reading tips, I have a few, but unfortunately, getting better at CR is a long-term proposition; you’re probably not going to get much better in a week no matter what you do, especially if you’re not a big reader. The best thing you can do for your CR score is to become a big reader! Don’t force yourself to read boring things, though. Find good writing that’s relevant to your interests! I’ve heard some people saying that reading NY times can be helpful.. What do you think about that and for CC I got 570 on my last practice but although I am understanding the whole text still can’t get all of the questions correct.. I think it needs more reading ..so I think I’m going to be reading more things that are relevant to the topics in the test and try to get above 650 for the June’s test.. And thanks!! Can you explain 20 in a simple way? You know, because the parabola is symmetrical at x = 0 and it goes through both bottom corners of the square, that points C and D are (3, –6) and (–3, –6), respectively. (0, 10) and (7, 10) tell you that the parabola is symmetrical around the x = 3.5 line (right smack in the middle of x = 0 and x = 7). You can use that symmetry line to solve for t. How far away is (–1.5, 0) from the x = 3.5 line? It’s 5 away. Therefore, t must be 5 away in the other direction: 8.5. If i’m not reading you right, upload a picture of the question you’re asking about.